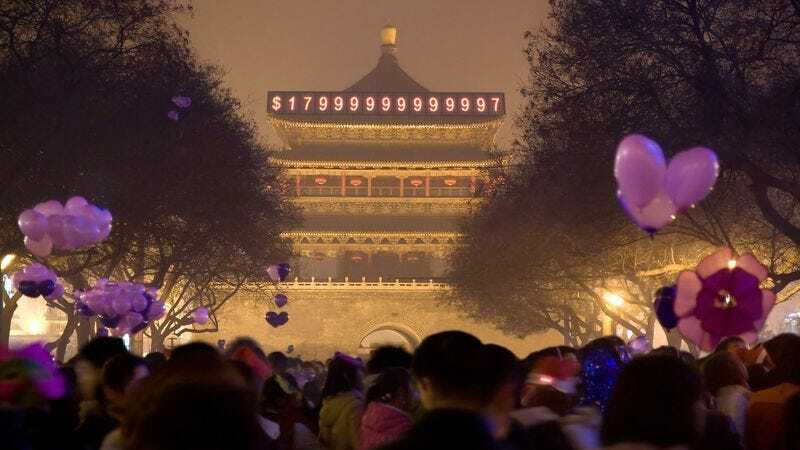 BEIJING—Celebrating the milestone with hugs, jubilant cheers, and singing, over 600,000 Chinese citizens assembled in Tiananmen Square today to watch the U.S. debt clock mounted above the Forbidden City reach the landmark sum of $18 trillion dollars. “You could stay home and watch it on TV, but it’s much more exciting to be here with people from all over the country to celebrate this momentous day,” said Beijing resident Xiao Bu, noting that he always arrives in the early morning to stake out a good location in the square every time America’s debt rises by another trillion. “I remember my father taking me to see the $5 trillion mark so long ago, and now I’m bringing my own children here to take part in the festivities. It’s really a special part of our nation’s culture.” While most revelers left shortly after the rollover, an estimated 100,000 reportedly decided to just wait around in the square until the clock struck $19 trillion.